Farmers Arms, Liverpool, L9 0EN. 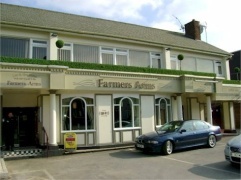 Farmers Arms pub review, map and rating. I'l admit that the pub had lost it's way and had got itself a very bad reputation a few years ago. But since its refurbishment last year, and the introduction of a local management couple the pub has once again become a pub that I am proud to say caters for the local community. The quiz night on a Thursday is a particular highlight of mine and my partners week, We would highly recommend this pub to anyone in the local area.